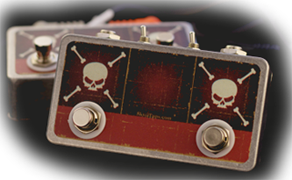 Double Skull Taps gives you two tap tempo controls in one enclosure. This is great to manage two tap tempo devices or to extend your Boss RC Loop Station’s functionality. Double Taps also are available with polarity switching to your needs. With Boss RC Loop Station you will need a TRS cable to connect to your Loop Station. You can purchase a Double Skull Tap with or without a TRS Cable. If you desire to use a Double Skull Tap on two separate devices, a simple 1/4″ mono patch cable can be used.